My housemate came home one day with the above purchase thinking that it would be a new weapon to sian more xmms. And so I decided to give it a test drive to see how it goes. It looked promising when I first put the egg in. 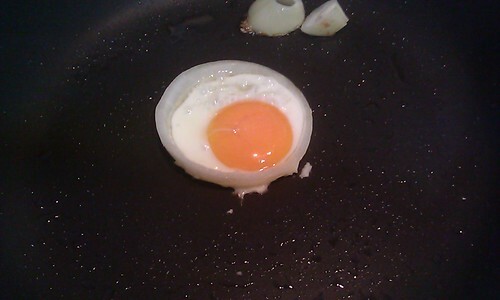 An important tip here is to crack the egg into a bowl first before pouring the content into the frying pan. Cracking the egg directly into the pan not only risk having bits of egg shell falling in but also not giving you the chance to burst any air bubbles that may be already inside the egg, thus ruining a perfectly beautiful egg. Also, with the egg in the bowl first, it would allow you to have a better chance of getting the yolk smack in the middle, which as you can see in the above attempt, I ish bobo shooter. First off, our gas cooker is too big or rather the pan is too small, that even the fire at the lowest setting is too high for the egg. 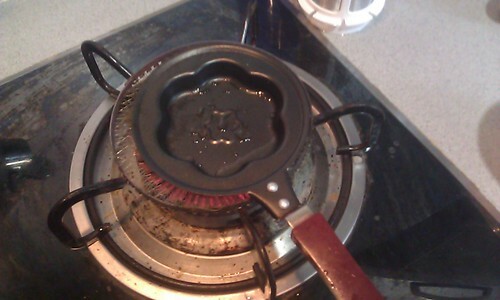 Coupled with the fact that the flower is small (thus the frying pan is deep), the top part of the egg cannot be cooked without the bottom getting burnt. Flipping the egg over-easy isn't possible either and so it's an egg that is burnt on one side and undercooked on the other. 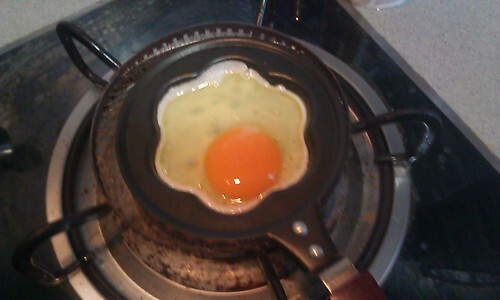 Actually, this isn't something new as I showed him the way I do my Sian XMM Sunny Side Up. Ideally, bell pepper would have been best coz of the petal cross-sectional shape but at the time when we were messing around with the frying pan, the onion was the closest I could find in our fridge. The tip here is to get a big onion, as big as you can find. Get the ring at the equator so that you do not have to have a ring that would be too thick i.e. too deep that you end up in the same situation as the flower frying pan where the bottom is burnt and the top undercooked. Why thickness is important, one may ask? Well, you need enough volume space inside the ring to content the egg, thus avoiding a spill. A cheat would be to scrape off the excess outside the ring should the egg spill over. The good thing about using bell pepper or onion or even hollowed-out tomato is that you are working this on a frying pan i.e. extra space allowing you to flip the egg, for an easy-over, if it so happened that your ring is too small and too deep. One thing to note is NOT to move the ring/egg when you flip over as it will break the yolk and ruin the flower pattern. Let it cook for a while before thinking of sliding your spatula under. Is how JayWalk does it.